Fredericka Brinkley shares stories of her experiences during a field placement in Ghana. It shouldn’t take spending three months in Ghana to align perspectives of privilege, but Fredericka Brinkley readily admits she needed the experience. 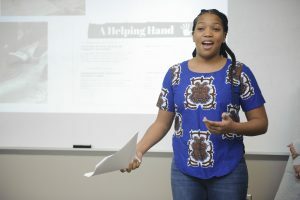 Brinkley, an advanced-standing MSW student and Mobile native, could have completed her required undergraduate social work field placement in Alabama – like many of her peers – but she believed an international field placement would provide the ultimate experience for her desired career in sustainable community development. Brinkley worked last fall in an advocacy role with a community development agency in Ghana. Among the issues facing residents in the Tema community of Ghana was girls practicing consistent menstrual hygiene. She worked with Ghanaian interns to teach proper hygiene and to monitor community centers that her office created in the community. Brinkley experienced much of what she expected: underserved communities and impoverished areas unlike anything she’d seen in Alabama. Observing how residents lived and managed their circumstances was “shocking” with each ride on the “tro-tro,” the most common form of public transit in Ghana. “It was comforting being there, where 99.9 percent of the people were Ghanaian and black,” she said, “but I also had to experience their culture, and that was hard for me. I got off the tro-tro one day and cried on the phone to my boyfriend that I thought I’d adjusted to the culture. It goes to show cultural competence goes beyond your own experiences – you have to experience it as they do to truly understand it. Brinkley shared these experiences with UA social work classmates during a recent luncheon. She focused on the many benefits of international field placements, from cultural competence to the daily lessons that can be applied broadly across the spectrum of social work. Brinkley worked in the Ghanaian village of Tema. She also prepared students for the practical challenges of being embedded in an unfamiliar community thousands of miles away from home, like missing the comforts and conveniences of home and close relationships with friends and family. Being separated from family was especially difficult for Brinkley, who talks with her mother several times a day. Her great-grandfather is 96, and she feared he would fall into poor health while she was in Ghana. She missed her 6-year-old sister and her boyfriend. Her family is also the inspiration for her future career in social work and her record of service, both in Mobile and during her undergraduate career at UA. Her great-grandmother, Emma Brinkley, advocated for affirmative action, and her grandmother, Linda Fitts, would take her to cook food for homeless people in Mobile. Brinkley also served as president of the Key Club of McGill-Toolen Catholic High School. Brinkley, along with her mother and cousin, would later create a Thanksgiving food delivery project in Bienville Square in Mobile. While at UA, Brinkley has worked as a mentor and freshman facilitator with UA’s First Year Experience and on various projects with UA’s Center for Service and Leadership, where she helped advance an existing coffee bean cooperative in Nicaragua. And while Ghana reaffirmed Brinkley’s desire for a career in international social work, her time working on her BSW at UA shaped her future even more.